Well, the homepage style of britishessaywriters.co.uk essay writing service calls to the trust of users. The face of this website is designed to show how solid and good this service is. Plus, the company is positioned as “Best Essay Writing Service UK”. Does this have something in common with reality? Well, let’s see. The overall picture is quite specific. Except of general or “English essays” Britishessaywriters.co.uk can offer you admission and nursing text writing. The last two are special fields, which are not available on any randomly chosen service. Additionally, one may like services on the professional help with assignment, dissertation and coursework writing. Sweet. 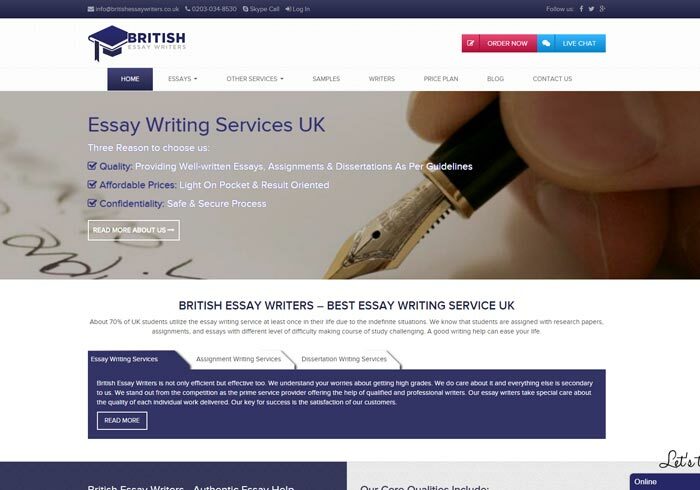 Still, if to compare with other services, the first glimpse on the “British Essay Writers” page doesn’t make you think about it to be the best service in a country. When entering the website homepage, one gets a pop-up ad window, offering 20% discount for a signup. Then, chat plugin says about 15% (additional, or what?) but you have to contact the manager in order to find out the details. That annoys and makes the user feel confused from the very beginning of interaction with the service. We didn’t even look at the prices yet! So why do they think we need discounts at once? So, let’s skip those pop-up advertisements. We’re not interested in sending email address to unknown guys or talking to them, are we? There is no info on prices directly on the homepage, so you’ve got to find that “Price Plan” button in the upper part of the site. Close that pop-up discount ad again, and see per-page-payments for “2:2 Standard”, “2:1 Standard” and “First Class” price plans shown according to a writing deadline. Clicking any of those three buttons causes no effect. Plus, we couldn’t see what exactly is paid even after visiting the appropriate topic page on the website. Payment methods aren’t visible as well. Prices offered by the service are around average, but if you want to get something extra (plagiarism check, for instance), you’ll need to pay additional costs. There are companies offering all the checks included in overall price, so we’ve got doubts. Customer support, working 24/7, and available via chat, phone, Skype and email, sounds like a guarantee that you’ll get all the necessary information and help on the process of placing and receiving your text order. Hope this option actually is like that. Otherwise, the aggressive advertisement pop-ups and the lack of information on exact payments might be the reason for the user to choose another writing service.